I had the privilege of interviewing Katherine Weaver, the author of seeing God in the simple things early in 2013 and here is the second half of that interview. Lisa: Are the people in your church receptive to you since your divorce? Katherine: That was difficult because we were attending the church where I worked. I’m not one to talk about the trouble we were having in our relationship, but unfortunately, I was alone in that. Everyone was devastated when we split and he didn’t tell them the whole story, only that I was the unrelenting b**** who kicked him out. The environment became so stressful, that I stopped attending that church even though I did keep my job. I was getting lectured by people who weren’t there. No, it was not fun. Lisa: But that kind of made you who you are now? Katherine: It has given me more strength. The last 5-6 years in my life have been my wilderness. I have been doing some treasure hunting to find what I learned in the wilderness. I have learned some important things, but it was not fun. Lisa: Did that experience help you find out where God is? Katherine: I found out who God is. That is so important, when you watch him take us through something like that, we learn who He is and we lean more on Him. He becomes real. Lisa: Will you be writing more books? Katherine: Yes, I have more essays that are ready for the 2nd book, but that is in the background. I am developing retreat curriculum that is an expanded version of one of my speeches. It’s called Lizards and Dragons. It’s about how the issues in our lives (like anger, resentment and fear) can start out as little lizards, but if we don’t deal with them, they turn into dragons. The second book is coming along, but Lizards and Dragons is where I am living at the moment. Please visit Katherine’s website at booksbykatherine.com. 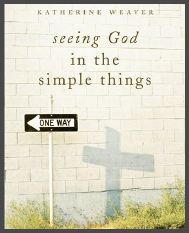 I had the privilege of interviewing Katherine Weaver, the author of seeing God in the simple things early in 2013 and here is the first part of that interview. Lisa: Where are you from originally? Katherine: I grew up in the (Williamette) valley, in Dallas, and then my family moved to Culver when I was 13. I went to high school there, got married, went to Central Oregon Community College, moved to Portland for 10 years, moved back to Madras in 2005. I call Central Oregon home. I love the climate and the ability to kayak! It’s something my mom and I do together a lot in the summer. Lisa: What is your spiritual background? Were you raised in church? Katherine: I would say I was raised in a Christian home, but not one that attended church religiously. I remember going, but I don’t know that it was every week. God was always understood though, He was part of our lives. Dad wasn’t able to go with us to church; he worked 7 days a week most of the time. He sacrificed so much for us to grow up in such a fantastic place. But you never realize that as a child. Then, when you become an adult, you look back and see what your parents went through. It’s humbling to see now how much they sacrificed for us. Lisa: Is this (seeing God in the simple things) your first book? How long did it take you to write it? I said, “Yes, I have 75 more!” and that was that. It took about a year to get through the publishing process, everything takes forever. But it’s done and published and was quite an experience. Lisa: But it sounds like you have had some life experiences that a lot of people can relate to, unfortunately. Part 2 of this interview will be posted in the next blog. Stay tuned!